The Standard Ten car of the 1950s. Homepage. 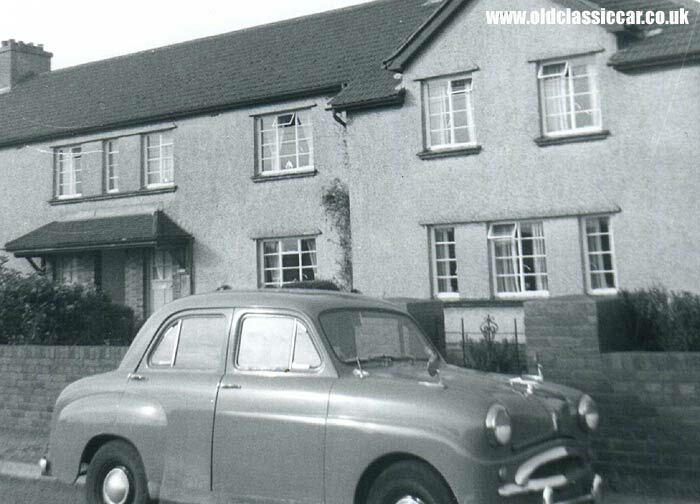 This page: Standard Ten photos, including two Tens parked in 1950s suburbia, and a new '10' being delivered. 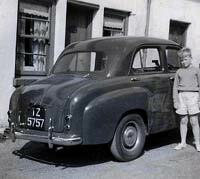 Firstly, a black Standard saloon parked with its happy owner. 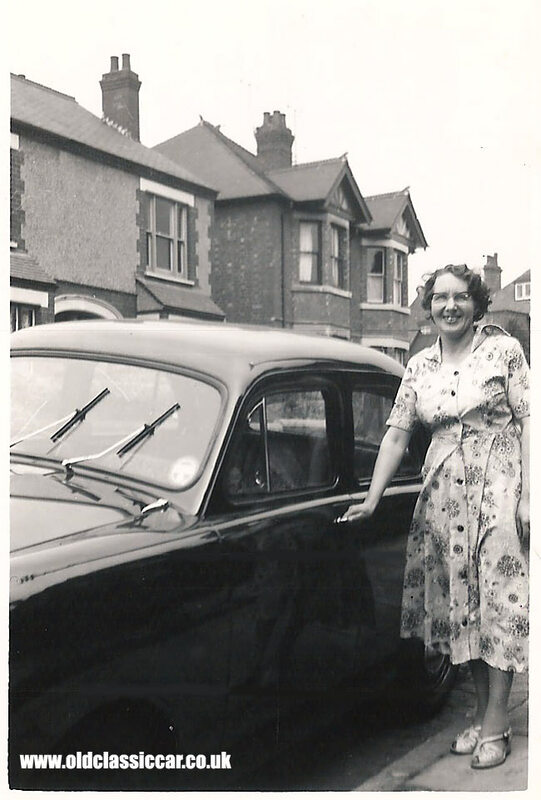 The scene looks like it dates to the 1950s, and shows a lady stood proudly alongside their Standard 10 - it may be an 8 but with its wind up windows it could only be a late example, or else a 10 which is more probable. 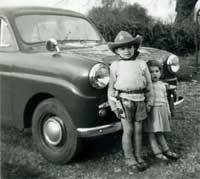 The car would date to the mid 1950s. The lady's dress is very flowery and distinctly 1950s in style and design, so the Standard was probably quite new at the time of the photograph. Also it's interesting to see the houses in the background - probably built in the 1920s and typical of British suburbia even today, although now they may well have UPVC windows, and a satellite dish nailed to the wall by now. 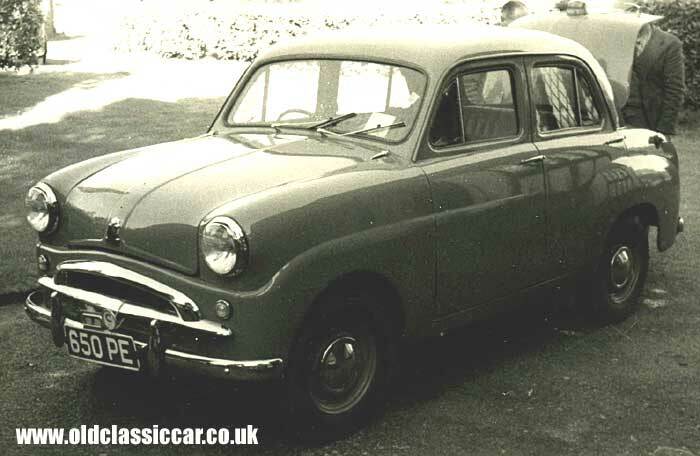 The engine fitted to these small cars was 948cc in size, and went on to be used (in this size, and larger versions) in all future Heralds and Spitfires, right up to 1980 by which time it was 1500cc in size. The engine first appeared in the Standard 8 in the early 50s, at which time it was (just like BMC's A Series) 803cc. The engine was an overhead valve design, all iron. Unlike most small Fords of the day, these compact cars had a four speed gearchange. 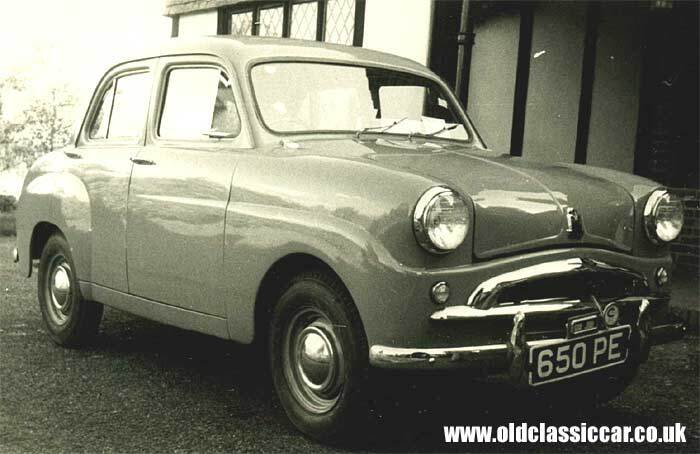 The 8 and 10 were available as 4 door saloons (no 2 door saloon was marketed), a compact estate car (called the Companion), or as a light commercial (van or pickup). The final incarnations of the 8/10 design were called the Pennant, and featured a revised front & rear wing line, in an attempt to modernise the design. The model died out altogether in 1959 with the launch of the Standard-Triumph Herald range (which reverted to a separate chassis design, unlike the Standard's monocoque construction). 2. A brand new Standard 10 on trade plates. 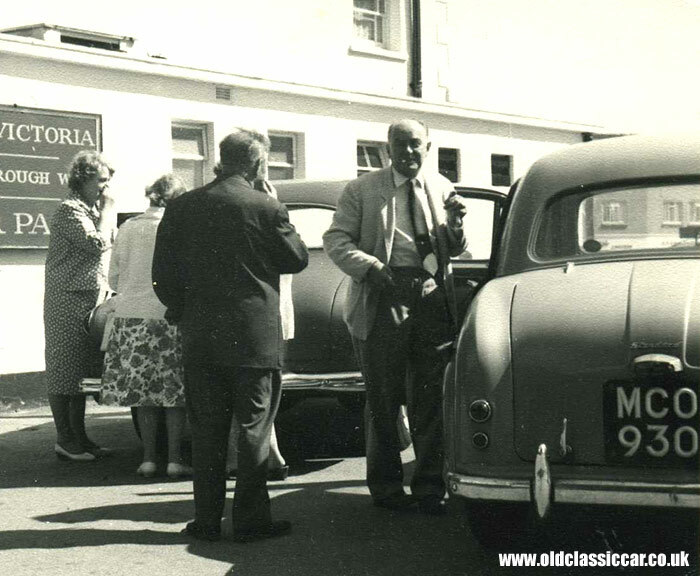 Next, two photographs showing a smart shiny new Standard saloon being delivered to its new owner(s). 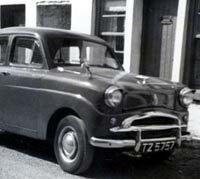 Note the trade plate attached to the front bumper, and 50s-style Commercial 'C' licence included with the trader's registration number (650 PE). 3. A 10+ year old Standard parked in suburbia, 1967. The following two photos in suburbia show a Standard Ten in September 1967, by which time it was over ten years of age. 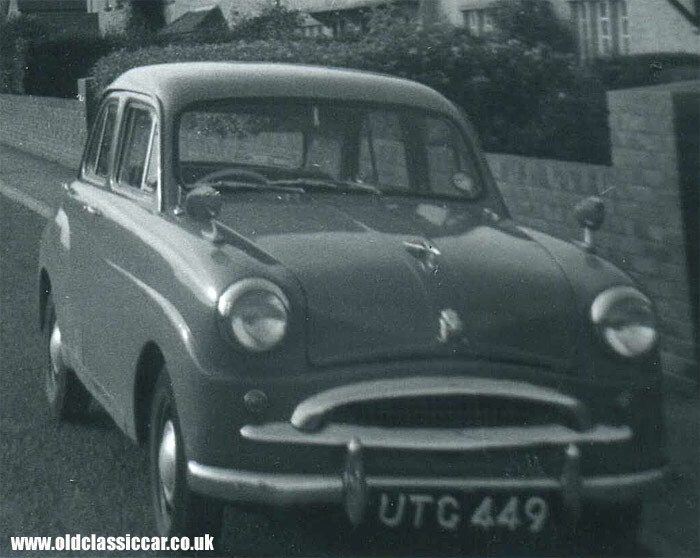 The car, reg UTC 449, was registered in Lancashire, some time after November 1954. 4. Two children and a 1950s' Standard. 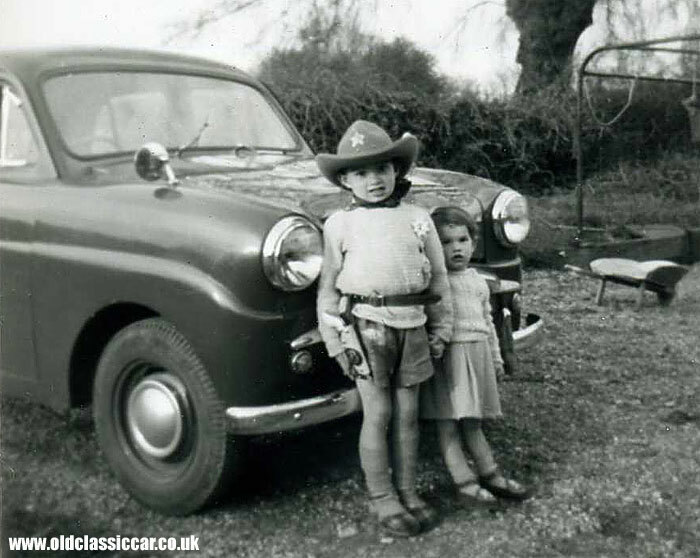 This photo shows a young lad - and his sister most likely - dressed as a county Sheriff, stood with a typical 1950s' Standard Ten. 5. A Standard 10 parked outside The Victoria. A gathering of retired ladies and gents seems to be taking place at The Victoria pub. The rear of the Standard 10 - a booted version - can clearly be seen, as can its registration: MCO 930, a May 1956-onwards series used in the Plymouth area. Was there a pub called The Victoria in that area? I can find mention of a modern-day hotel with a similar name, but this definitely looks like a watering hole to me. 6. An Irish-registered Standard Ten of 1955. Ian kindly sent this next pair of Standard Ten photos over. 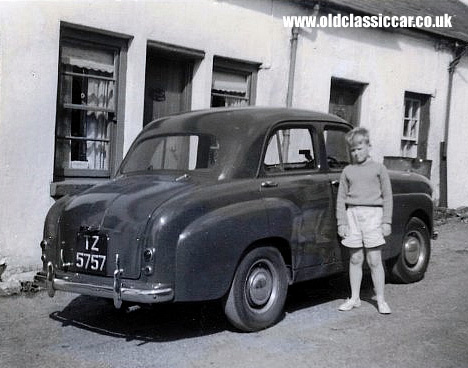 The car belonged to this father, and regarding this car he notes: "The dark green 1955 Standard 10 bears a TZ Belfast registration. Both photos were taken in front of my granny's old cottage on The Hill, Groomsport, County Down, Northern Ireland in 1961. That same year she took us 200 miles to Galway, a trip that took about 10 hours!" The first picture shows the car from a front three-quarter angle. This example was fitted with small headlamp "peaks", a driver's side wing mirror, and shiny wheel embellishers, the bonnet mascot was a feature of later Standard Tens. 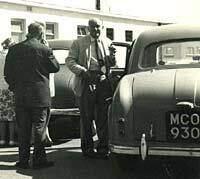 The second of Ian's photos shows the rear three-quarter view of this great little car. Thanks for the photos Ian! 7. A Standard Super Ten in Australia. "I have just been looking at your site, doing a bit of dreaming on my first car, a brand new, two tone white over mustard 1959 Standard Super Ten costing 895 GBP, two tone red upholstery, a very smart car with a cream steering wheel! Very proud and did one long trip to Sydney covering about 2,500 miles and shorter ones of about 1,000miles, and averaged 40 mpg. 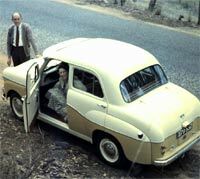 Traded it in for a new white 1964 Morris 1100 (light years ahead in driving), 35mpg, which was traded for a new 1969 Austin 1800, two tone cream over beige, fantastic car, tons of room, took anything in its stride, loved the Australian Outback and mountains, drove over 270,000 miles, cost $A2,275 (got $A200 discount for cash) and sold it privately in 2008 for $A2000. 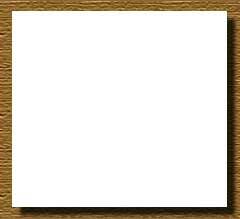 I extended the 1800's life by also driving a white 1963 Mini purchased in 1985 with only 26,000miles on the clock for $500, I sold it in 2005 for $1,750 at 130,000 miles." 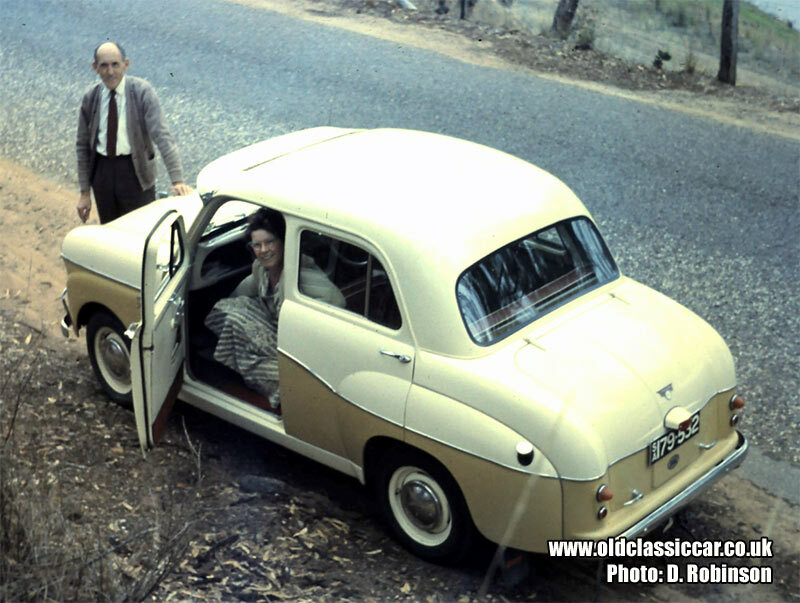 "The images were scanned from slides, with the top photo [taken in 1960, in the Adelaide Hills South Australia] being the more true colour of the car." 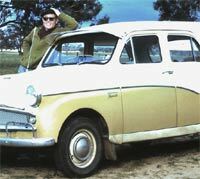 "The 1961 photo [below, at the South Australia-Victoria Border] shows a frame bolted to the bumper just below the headlight, this was used to carry a water bag which was made of canvas in which the water was kept cool, although some water was lost. 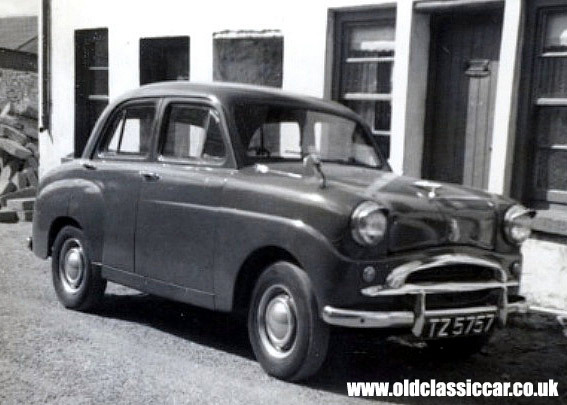 It was the "thing" to have one in those days, but not now for the general motorist. The exception is if you go "bush" then you carry plenty of water!" Thanks for the photos Denis. There are some interesting differences when comparing UK-spec cars to those sold in Australia. The chrome trims that run down the side are different to those found on UK Super Tens, plus the latter didn't have trim that continued around the rear of the car. The grille treatment and rear badging also differ between the two markets. Some time ago, an Australian visitor to the site sent over details of his preserved Standard, the story of which can be found on this page. 8. Two Standards at a 1950's garage. Thanks to Stephen Thorpe for this next photo. 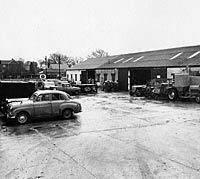 The location is the yard, and workshops, behind the Wadham's garage in Waterlooville, which amongst other things was a retailer for Ferguson tractors and implements (a photograph of a Prefect parked at the petrol pumps outside Wadham's can be found on the E493A Prefect photos page). There's a mouthwatering selection of vehicles on show, including a Standard 10 saloon, a rare Standard 7cwt pickup (you'll find more information regarding the Standard 10-based vans and pickups on this page), several tractors, and a BMC (Austin/Morris) lorry. Most intriguing of all though is the vehicle parked alongside the Standard saloon, of which only a few tantalising details are visible. It's pre-war, with a long bonnet and a magnificent pair of Lucas P100 headlamps fitted to it. The sloping rear lines of its bodywork can also be seen, alongside the rear of the Standard. More Standard 10s on Old Classic Car. 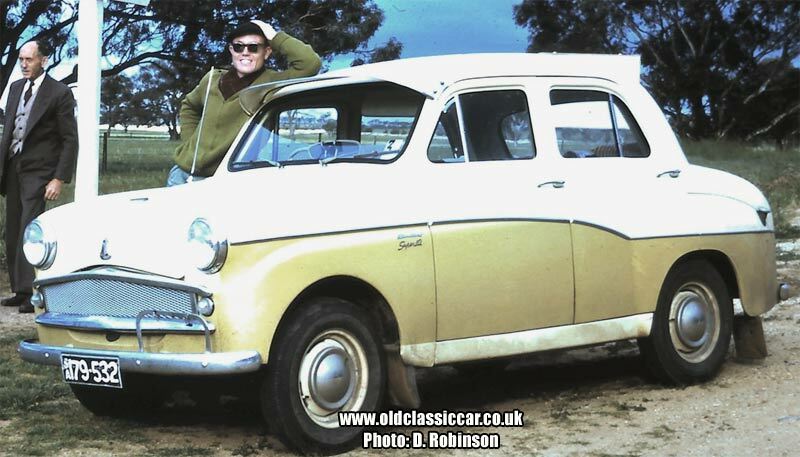 I've owned a pair of 8s, a Companion estate, and a Super 10, the latter fitted with 2 pedal Standrive transmission - see more on my Standard 10 page. 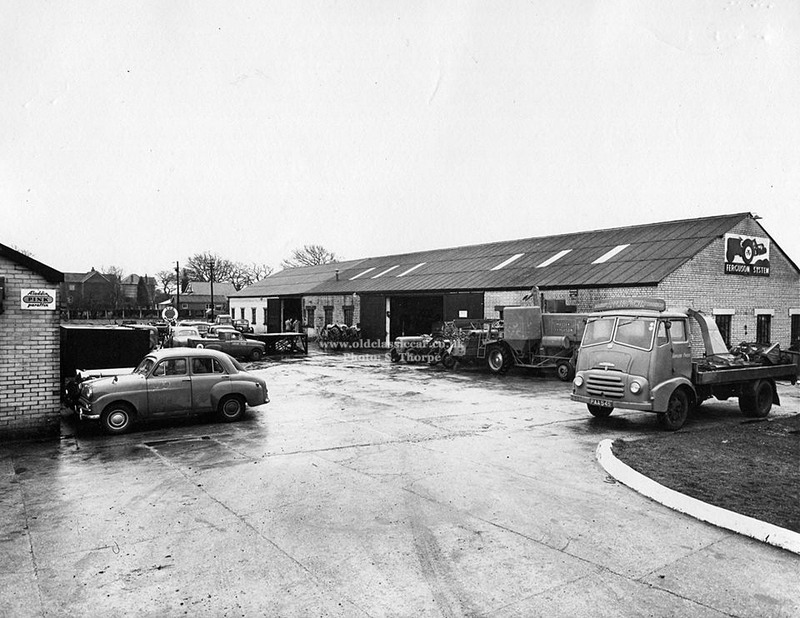 Some photos showing another Standard Ten, taking part in 1950s autotesting, can be seen here.